Do you ever wish you had a word processor that just processed words? Font selection? Pah! Styling? Just a tiny bit, please. Or maybe you read Scott Nesbitt’s article on Opensource.com and thought “I’d like to try this!” If this sounds like you, then it may interest you to know that WordGrinder is now available on Fedora 25, 26, and Rawhide. I should clarify that it’s only available on some architectures (x86_64, i686, aarch64, and armv7hl). 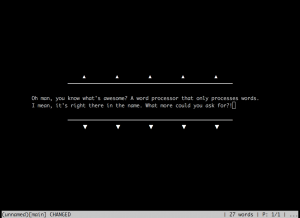 WordGrinder depends on luaJIT which is only available on those platforms. This is my first new Fedora package, and I have to say I’m kind of proud of myself. I tried to volunteer someone else for it, but he didn’t know how to build RPMs so I ended up volunteering myself. In the process, I had to patch the upstream release to build on Fedora, and then patch my patch to get it to build on Rawhide. In true Fedora fashion, I submitted my patch upstream and it was accepted. So not only did I make a new package available, but I also made an improvement to a project written in a language that I don’t know. This entry was posted in FLOSS and tagged Fedora, fedoraplanet, WordGrinder by Ben Cotton. Bookmark the permalink.